My Grandma used to say “Security is a casserole in the freezer.” I know how she felt. In our household, we believe security is a pot of soup on the stove. The security comes from soup’s nourishing presence – quickly heated to provide a warm and satisfying meal. I have even been known to indulge for breakfast. Really delicious soups with layered, deep flavor will not make it onto Rachel Ray’s 30-Minute Meals. 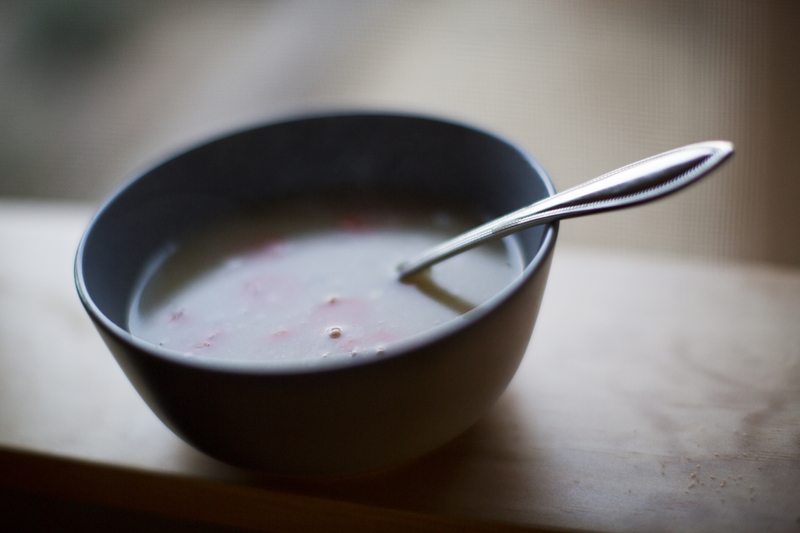 Traditional soups are slow food but, once created, are a go-to fast food, reheated in minutes. I often make soup in the morning and it’s ready when I drag in at 6:45 with three hungry children nipping at my heels. It then also serves as the centerpiece for school lunches the next day. A steaming bowl of soup imparts a certain comfort in those cold months – like a little blanket for the soul. Soup is a house waiting to be built. Provide the foundation and let creativity and improvisation guide your walls and windows into place. Stock or broth is your first essential element. The general consensus is stock is made with more bones and less meat while broth is made with more meat and fewer bones. Vegetables alone can be used to make a broth. Do not be intimidated to make your own at home. Bones, onions, garlic, celery, peppercorns, and bay leaves covered with water by an inch or two and long-simmered on low heat (I do poultry for 18 hours and beef/pork/lamb for 36-48 hours) in your crock pot or on the stove will yield a beautiful broth with about 5 minutes of prep. With a little meat on the bones, roast at 400 degrees for 20 to 25 minutes first. This will deepen the flavor. I add a splash of vinegar to the water to help leach the minerals out of the bones. Broth made this way is full of gelatin, amino acids and minerals. Next, you need your flavor base. A flavor base is a collection of aromatic vegetables sautéed slowly in fat (coconut oil, lard, tallow, or butter). The classic French mirepoix, my go-to, is a mixture of two parts onion to one part each carrots and celery. The soup base manifests in many forms across cultures. “The Holy Trinity” in Creole or Cajun cooking is equal parts onion, green bell pepper, and celery while the German Suppengrün combines carrots, celery root and leeks. The list of variations goes on. Let’s stick with a mirepoix for now. Have your stock strained and waiting in a separate vessel before you start cooking. Add onions to your fat of choice in the soup pot and let them soften a bit. Then let your carrots and celery join the party. Salt and pepper at this stage will enhance flavor and help break down the vegetables faster. Cook them until they are soft and starting to caramelize, leaving little brown bits of goodness on the bottom of the pan. Your future soup will thank you. If your recipe includes chili powder or curry or another smoky, lovely spice, add it now, before your broth, to let it toast a little. Now is when the pantry-purging creative storm can begin. Of course beautiful soups develop from recipes and planning, but if you have steps one and two down, you can craft a nutritious, soul-warming soup from the ingredients you have on hand in no time. Meat, vegetables, spices, herbs, and creamy elements can all be added at this stage. If your soup will include meat, add a little fat to your soup pot, sear your meat on all sides or brown it if using a ground meat. Remove the meat but do not clean your pot at this point. The brown bits on the bottom mean big flavor. Add a little more fat if necessary and start cooking the onions (or whatever manifestation of the allium family strikes your fancy) and continue with your mirepoix. The exception is if you are using already-roasted meat. In this case, skip the searing step. Other vegetables such as kale, more carrots, tomatoes, broccoli, beets, mushrooms, or potatoes, can be sautéed with the mirepoix or added to the broth to simmer until done. Once cooked, blending is an option for a creamy or puréed soup. Finishing your soup is easy, fast and allows for additional creativity. Adjust your seasonings to taste at this point. Soups with homemade stocks will take more salt than you expect. A little acid in the form of wine, vinegar, or lemon juice can brighten the flavors of a soup at this stage. The addition of something a little creamy, crunchy or fresh as a garnish finishes the dish. Chopped fresh herbs, crumbled cheese, sour cream, crumbled bacon and toasted nuts or seeds are all options.